06.05.2017. Mirth, Marvel and Maud. London. Down From Day One and Maud are proud to announce The Haggis Horns will be joining Mr Thing on the 6th May, to make this an unmissable night for lovers of funky soulful beats. As well as being the horn section for the Craig Charles Fantasy Funk Band, they have played with such household names as Mark Ronson, Jamiroquai, Martha Reeves & The Vandellas, Amy Winehouse, John Legend & The Roots and The Brand New Heavies to name but a few! 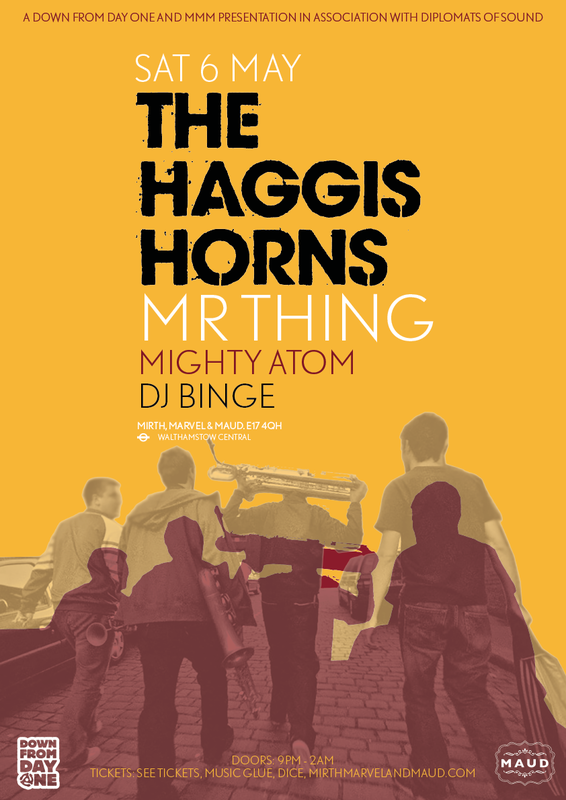 Live, The Haggis Horns are a funk fuelled powerhouse that rock audiences the world over, they rip up the dance floor with the virtuosity of trained jazz musicians and we can’t wait to for them to join selector extraordinaire, Mr Thing, for what is sure to be an absolute smasher.